Did Forrester Research CEO George Colony really say that? 15 years? I’m scratching my head. The Web 2.0 is relevant today. E.g., Facebook has over 400 million users right now. Fifteen years from now passes through several generations of new technology! For Colony’s sake, I hope CMS Wire misquoted or he misspoke. I’ll tweet him and see what he says. Posted on April 25, 2010 July 11, 2012 Categories Technology, WebLeave a comment on Did Forrester Research CEO George Colony really say that? 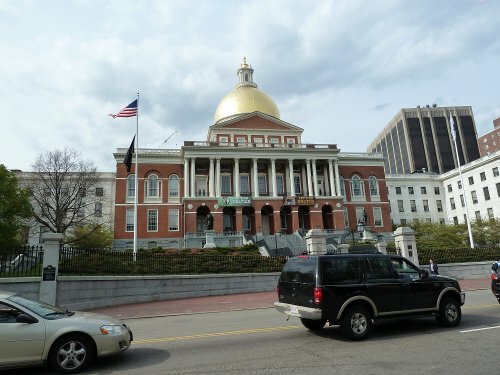 Amazing: Massachusetts lets for-profit companies advertise on its capitol! The Celtics and Bruins are for-profit commercial firms owned by Wycliffe Grousbeck and Jeremy Jacobs. For-profit as in the same kind of corporate entity as Exxon, Microsoft, and Citibank. I’d love someone to do an open records request and see how much Wycliffe and Jeremy paid Massachusetts for this. I’ll bet nothing! This appears sleazy. But what else should I expect from the state of the Kennedy dynasty and John Kerry? Note the huge numbers of pedestrians on the road, the dangerous interactions between various transportation modes, the lack of efficiency, and the layers of clothing. I don’t know how many of those buildings survived the 1906 earthquake except–of course–the building at the end. I’m not fat, I live in my own house, and I don’t eat Cheetos, but I do wear t-shirts. Oh, and my blog was the source for one of his station’s broadcasted stories.